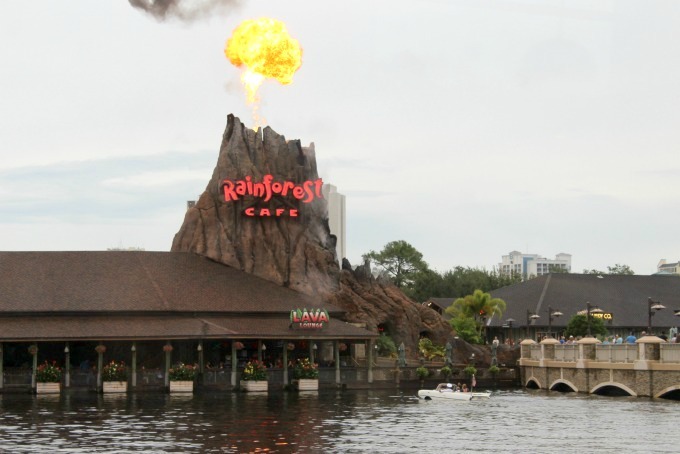 Trying to decide where to eat at Disney Springs? 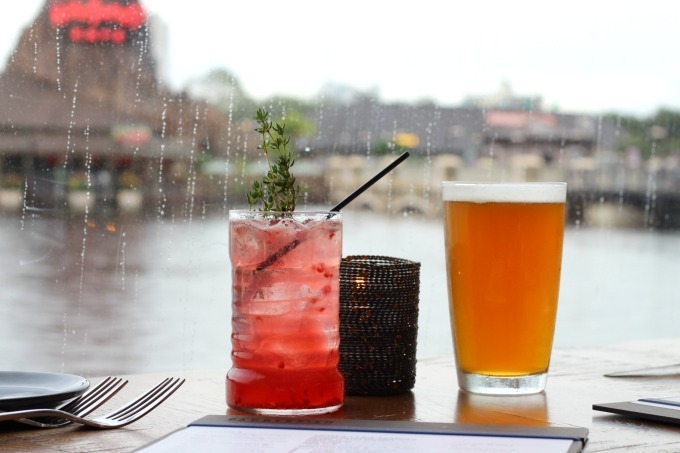 There are no shortage of great restaurants but only one where you can dine on a paddleboat overlooking the water. 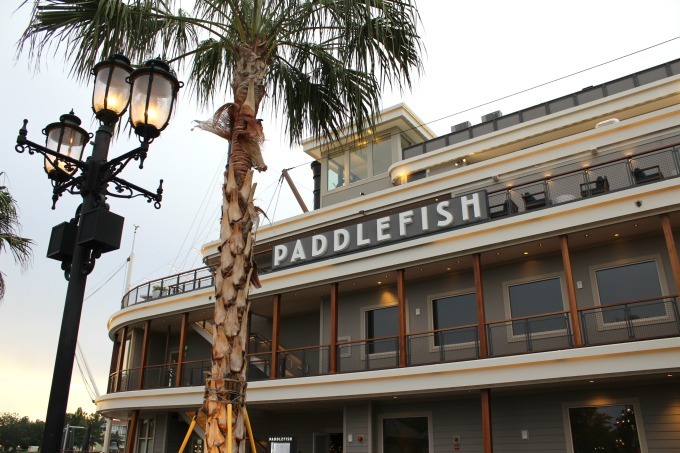 Find out why you should visit Paddlefish next time you head to Disney Springs. Thanks so much to Paddlefish for hosting our dinner. As always, all opinions are my own. When my girls took a vacation to visit my parents, I wanted to take full advantage of it. My hubby and I don’t get much alone time so I got busy planning some fun getaways. Our trip started in Clearwater, Florida but after a couple of days there, we headed to one of my favorite cities…Orlando. It’s rare that we go anywhere without the kids and I wanted to make sure that I got some good date nights out of it! One place that I was really looking forward to visiting was the new Paddlefish restaurant in Disney Springs. Formerly Fulton’s Crab House, it has been completely made over and just reopened earlier this year. We were hoping to be able to dine on the roof but the Florida weather had other plans for us. That being said, the view was pretty nice from inside the restaurant, despite the rain. With large windows overlooking the lake, the main dining room is bright, airy and open. I wanted to start with a cocktail but wasn’t sure which one to order. We had a terrific waitress who was very knowledgeable about the menu and she steered me towards the Captain Handsome. Made with vodka, raspberries, framboise and thyme, it was light and fruity, the perfect choice. 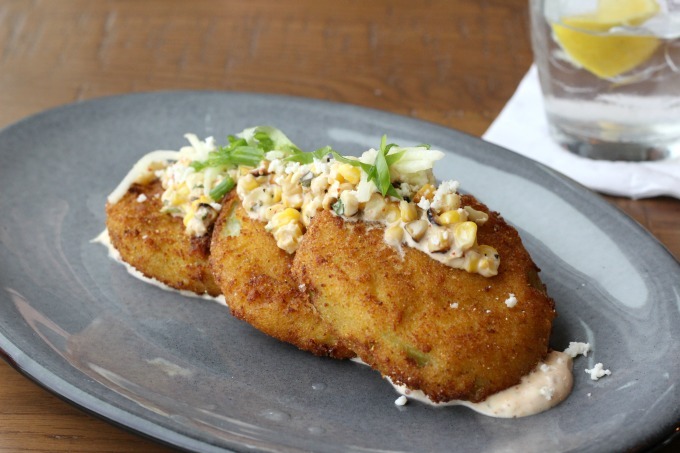 Don’t ask me how I grew up in the south without ever trying fried green tomatoes but somehow I did. I loved the movie, just never tried the food. Shockingly, my hubby had never tried them either so we figured it was about time. When they brought them to our table, I couldn’t wait to dig in. The thick slices of tomato were perfectly breaded and tasted delicious dipped in the remoulade. I’d plan to share because you get a good sized portion. I originally planned to order the Hawaiian opah but there’s a shortage and it wasn’t available. 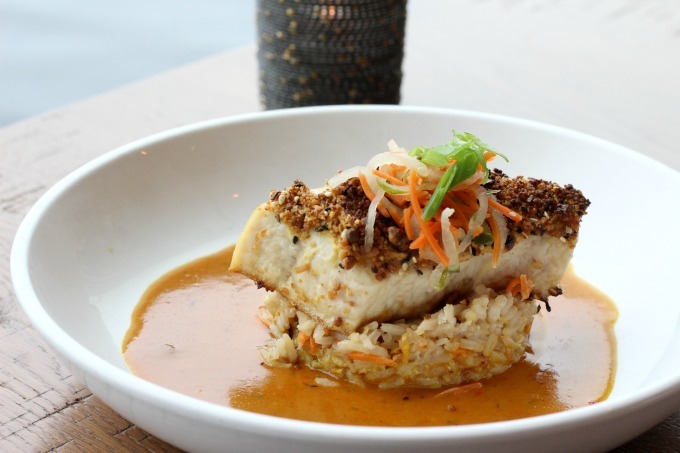 However, the waitress let me know that they could prepare the swordfish the same way, with macadamia nut crust, curry and crab fried rice. I’d never tried swordfish with macadamia before but now I might just try that with all my fish…it was really good! 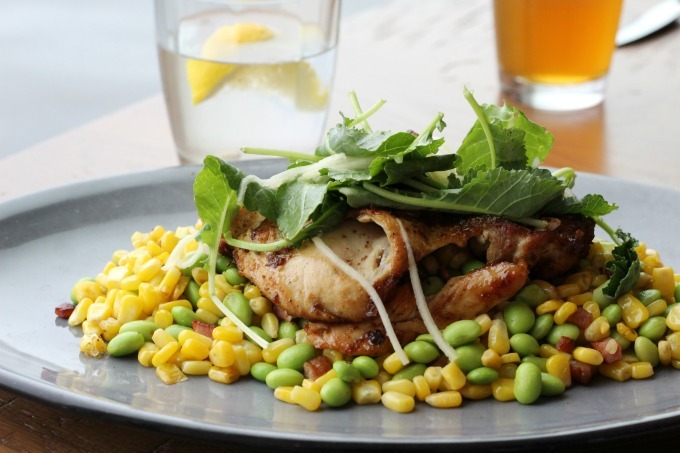 Jon went with a half chicken with Carolina mop sauce (a tangy vinegar BBQ), edamame bacon succotash and pickled watermelon. It’s served boneless over a bacon and corn succotash and he completely finished the chicken, which means it got his official seal of approval. I loved looking out over the lake during dinner. There were plenty of volcanic eruptions and floating cars to keep us entertained. Though we weren’t able to dine on the roof, we did take some time after dinner to head upstairs and check it out. I definitely want to go back because the view of Disney Springs was pretty amazing. There’s also a full bar on the roof so it would be a fun place to just chill and enjoy cocktails. We really enjoyed our dinner at Paddlefish! The service was terrific, the food was delish and well, you saw the views. While it makes a great date night destination, it’s also the kind of place the kids would love. With a volcano, floating boats and even the occasional otter swimming by, they’ll be pretty entertained. 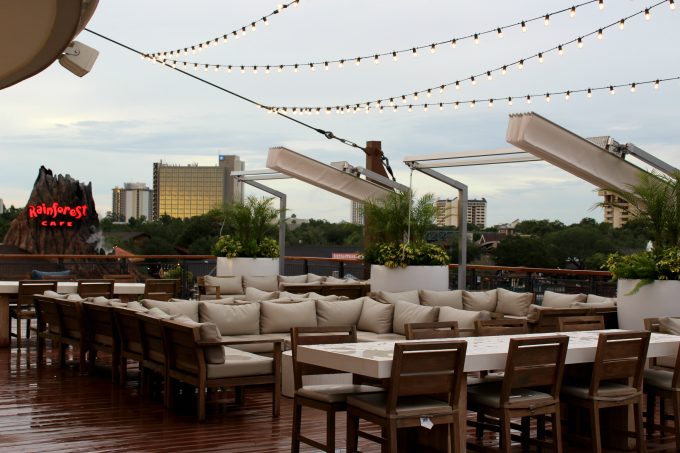 Next time you’re in Disney Springs, stop in for a meal or just have drinks on the roof and enjoy the view. Either way, you’ll have a great time!